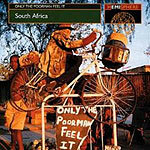 CD review: "Only the Poorman Feel It"
This review first appeared in the July 28, 1995 issue of the North County Blade-Citizen (now North County Times). This collection of contemporary South African pop is both easy on American ears and fresh and fun. Those familiar with Paul Simon's "Graceland" album, with its star-studded roster of South African musicians from a decade ago, are likely to also enjoy this album. Few of the names here will be familiar to casual American listeners, except perhaps the noted poet Mzwakhe. But all of the music is polished and accessible. Most is danceable, with a familiar Western 4/4 beat  yet with uniquely African lyrics and instrumentation. This collection is part of a new series of world music EMI is releasing as part of its hEMIsphere project. If you're curious as to what folks on the other side of the world are listening to today, this is a darn good place to start.